I am excited to be launching a new column over on Paste Magazine, all about one of my favorite subjects: fermentation! The first column is devoted to the subject of SCOBYs, the gelatinous looking organism that you have to have in order to brew kombucha at home. Amongst those who brew their own kombucha, I have found that many people have stories about their SCOBYs, as well as a sense of emotional attachment to them. One friend of mine even named his. Today we have a renewed appreciation for this old tradition, and people are taking to fermentation with fervor. Some of us get into baking sourdough with a starter and others launch into the world of pickling. But whatever kind of fermentation you do, there’s a high chance that you’re adamant about it. Kombucha is the perfect example. For many, kombucha has become a gateway drug into the world of fermentation. Fueled by an increasing interest in the health benefits of probiotics, the sales of kombucha have grown exponentially. 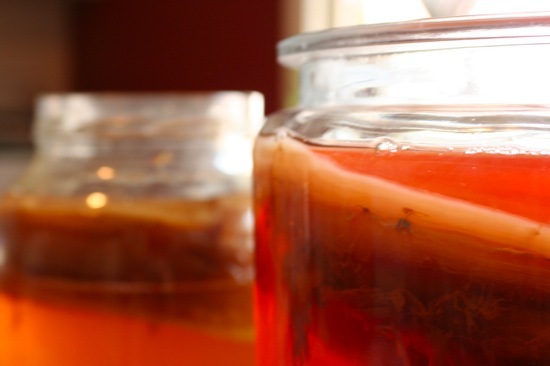 Kombucha sales for 2015 are projected to be upwards of $500 million. But at one point or another we realize that our addiction to the bottles at the grocery store is becoming an expensive habit, and it’s high time that we brewed our own. This is the moment that we turn from kombucha fan to kombucha fanatic. Kombucha: Love it or Hate it? Love it. So yeah… I’ll acknowledge that it looks gross, but there’s just something about brewing your own kombucha, and if you haven’t already jumped on the fermented tea train, it’s time to do it. Check out the latest installment of Foodie Underground to find out how (and why you should).